Listen to Lara (owner of Yoga Peeps) and I talk about the NZ Ministry of Health, truth, surrender, planting seeds, the yoga of economics, and abundance. We had this chat back in November 08. Episode 61: Kara Leah Grant, New Zealand. 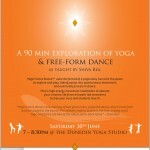 Come and experience an energetic, creative, full-spectrum approach to embodying the flow of yoga as taught by Shiva Rea. Learn classical and innovative approaches to vinyasa yoga and the state of flow. 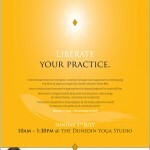 July 1st at The Dunedin Yoga Studio. Bookingsessential.